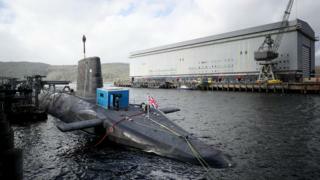 A £235m contract to maintain the nuclear engines of the UK's fleet of submarines has been confirmed. Defence Secretary Gavin Williamson made the announcement while visiting Rolls-Royce's Raynesway plant in Derby. The deal covers systems on the Trafalgar, Vanguard and Astute class subs until 2022, securing about 500 jobs, mostly in Derby. Mr Williams also revealed the third of the new generation Trident submarines will be called HMS Warspite. It will join Dreadnought, Valiant and an as-yet-unnamed vessel as part of a frontline nuclear deterrent system which has at least one Trident missile-equipped sub on duty at all times. How important are UK's nuclear weapons? The £31bn programme is due to come into service from 2028. Mr Williamson noted that 2019 is the 50th anniversary of the continuous deterrent system. He said: "This significant milestone for the Royal Navy would not be possible without the skills and ingenuity of our industry partners who supply and maintain equipment. "Rolls-Royce plays a critical role in supporting our submarines and I'm pleased this contract will help sustain 500 highly-skilled jobs that help protect our country." In November the Ministry of Defence was told it had a £7bn gap between its spending plans and its budget.